In an age that witnessed both dwindling institutional patronage and a rising bourgeois art market, many artists viewed portraiture as their bread and butter. For the Romantic artist, however, a portrait was more than just a lucrative commission – it was also an opportunity to capture the underlying essence of the sitter’s soul, and to make visible through pictorial and symbolic means man’s spiritual connection to the natural world. In this respect, Philipp Otto Runge’s The Hülsenbeck Children (1805-06), a portrait of the children of his brother’s business partner, could be regarded as one of the finest works of the era. In this painting, Runge renders the world around his three young sitters in great naturalistic detail and yet also manages to present it subjectively from their point of view. The children, at once small and monumental, and the lovingly detailed townscape behind them are given equal aesthetic weight in a manner reminiscent of Raphael’s Madonnas (which Runge greatly admired). Also remarkable is the extent to which Runge employs gesture and expression to portray each sibling as a unique individual. 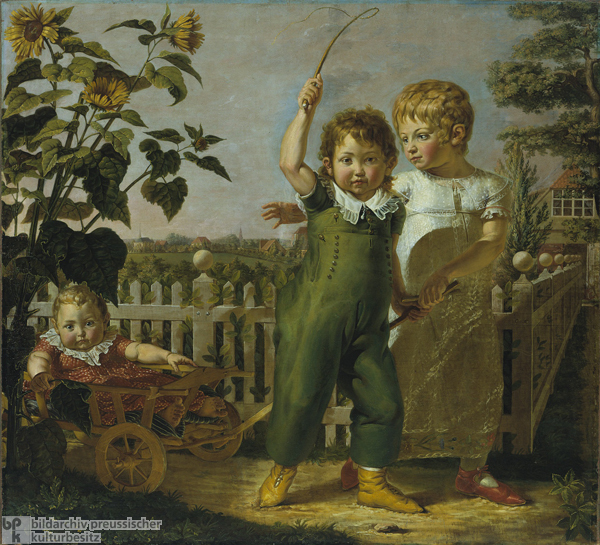 While this sensitivity to children’s personalities must be ascribed mainly to Runge’s own talents of observation, the painting also speaks to larger cultural and historical shifts in the perception of early childhood. With the rise of the Enlightenment notion of Bildung (education in the broadest sense of individual character formation), philosophers and writers associated with both the Sturm und Drang movement and Romanticism – most notably, Karl Philipp Moritz (1756-1793), whose students included Alexander von Humboldt, Ludwig Tieck, and Wilhelm Wackenroder – focused increasing attention on children in an attempt to understand the complex relationship between rationality and feeling. In the Romantic privileging of the “primitive” and the “naïve,” the child occupied a particularly special place.